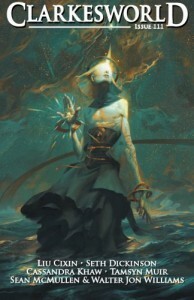 I enjoy short stories so I got myself a subscription to Clarkesworld Magazine. I started off with the December issue. I had read a few stories on their site previously but decided for $2.99/month I can treat myself to the whole thing. A short story has to grab the reader and involved them in very few words, like a comic only without the added help of art work. These issues do have a few renderings that make the feel of Science Fiction and Fantasy more pronounced. Issue #111 was decent as with most magazines you have exceptional stories and those that just fly through just so you felt you got your money's worth of reading the whole issue. Yuanyan's Bubbles by Liu Cixin was the first story and I must say I was debating on whether I wasted my $2.99, at first. The story is about bubbles, blowing them or at least the first few paragraphs and being a short story one tends to get a bit worried since the first few paragraphs are what are supposed to keep you interested before moving on. But I was not disappointed in the end. The most confusing story Morrigan in Shadow, by Seth Dickinson. Confusing but good and again I was worried I probably should have just went with buying single issues that interested me instead of committing to a monthly subscription. The best story in my opinion, which is what this is all about anyway, was Union by Tamsyn Muir. So much information into a few pages was profound. I really wish I had this talent. The use of dialog is very important in any story but short stories much more so since this is how the reader understand the characters in such a short time. Muir did an excellent job of portraying the different characters and giving us each a sense of who they are and why they are that way.